With Sarasota County’s Planning and Development Services staff having issued 4.2 percent more permits so far this fiscal year than it did in the first half of the 2015 fiscal year — and with the construction industry having complained about delays in getting permits approved — the County Commission this week unanimously agreed to the immediate hiring of three new employees to help shoulder the load. The $174,774 expense will be covered by a special revenue fund that contains application fees related to the department’s work. None of the money will be coming out of the county’s General Fund, which comprises the ad valorem tax revenue the county receives. 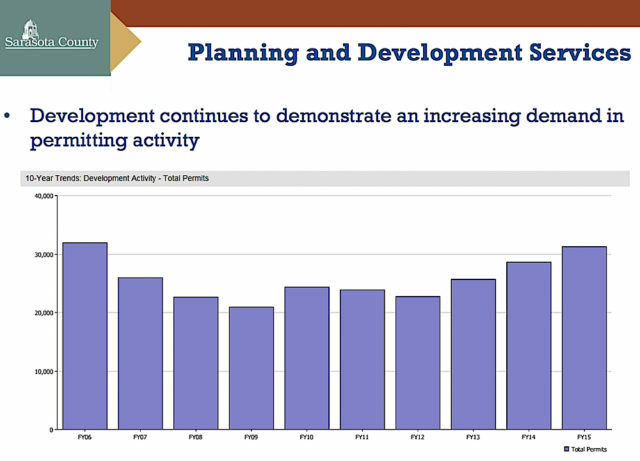 Osterhoudt had presented a number of statistics to the board to explain the increased department workload. During the board’s mid-year budget review on April 27, Osterhoudt explained that the volume of work in the Planning and Development Services Department had reached the point where staff realized the “extraordinary need” to seek additional employees prior to the start of the 2017 fiscal year. 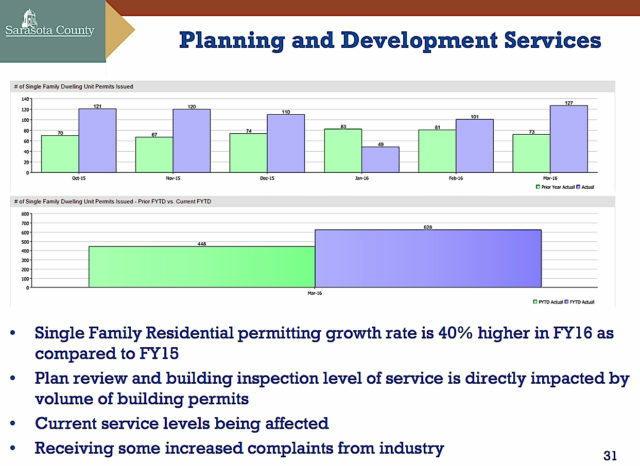 Showing the commissioners a graphic with 10-year trends in permitting, he noted that the total number of permits county staff handled in the 2015 fiscal year surpassed 30,000 — a mark last seen in the 2006 fiscal year. At the mid-point of this fiscal year, he continued, building permit activity is up 4.2 percent and is expected to exceed the FY 2006 level. Additionally, Osterhoudt said, the number of permits issued for single-family homes is 40-percent higher this year compared to the first six months of the 2015 fiscal year. Zoning reviews are up 13.7 percent over last year, he added. The department has only four zoning plan reviewers, he pointed out, and they are handling about seven plans per day. However, he noted, that is not all they do. They receive a lot of calls, he noted, and they work with walk-in customers. Much of their general responsibility involves engagement with and education of the public, Osterhoudt explained. 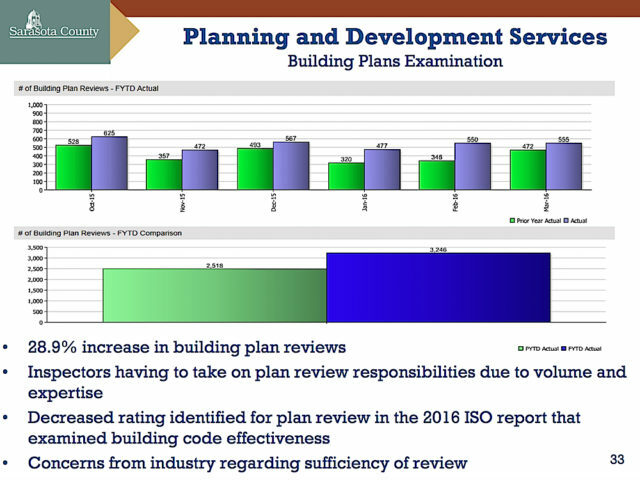 Offering yet another statistic, Osterhoudt said the department is experiencing a 28.9-percent increase in building plan reviews so far this year. One way staff is handling that, he continued, is having inspectors with expertise in trades such as plumbing and electrical work look over those aspects of plans. However, they should be in the field, investigating construction projects, Osterhoudt pointed out. Floodplain review work also has increased, he said; it had risen significantly from the 2012 fiscal year to the 2015 fiscal year, he added. Yet, the department has only one person who is qualified to handle that work, even though, Osterhoudt noted, the department has both North and South county offices. Earlier during the mid-year budget discussion, Kim Radtke, director of the county’s Office of Financial Management, told the board that of the 628 permit applications staff has handled so far this year for single-family home construction, 308 were generated in North County and 320 in South County. “What I hear is ‘We need more [full-time employees],’” Caragiulo told Osterhoudt. How many of the department’s building examiners are cross-trained, Caragiulo asked. In other words, does a zoning reviewer handle building plans as well? Osterhoudt explained that because of the way special revenue accounts are set up for the department, a zoning fund must pay for zoning review work, while a building fund must cover building reviews. Additionally, Osterhoudt said, each person is trained, certified and licensed to handle specific types of work. 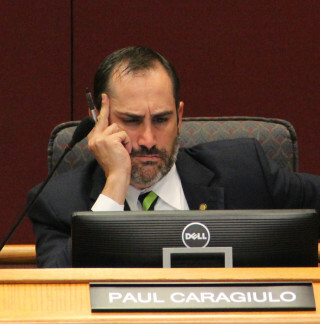 After further questions about the specific types of responsibilities staff members in the department can and cannot handle, Caragiulo then pointed to the array of statistics Osterhoudt had provided the board. In the end, Caragiulo said, it appears the total workload is up 4.2 percent. Osterhoudt responded that certain types of applications require more intensive reviews. That is correct, Osterhoudt told her. Commissioner Carolyn Mason made the motion to approve the request for the three new employees: a zoning plans reviewer, a building plans reviewer and a floodplain reviewer. Commissioner Charles Hines seconded the motion, which passed unanimously.